Thank you for your interest in Smithville Christian High School. We are excited about the blessing of Christian education, and we hope you are too. We are proud of the way we can meet the needs of all students and we work hard to make Christian education affordable to families. Please read on to learn more about how Christian education can be a blessing to your family. Because Smithville Christian High School is an independent school which receives no government support, the annual tuition payments can seem daunting, especially if this is your first introduction to Christian education or if you are already paying an elementary school tuition. However, there are a number of bursaries and programs in place to help. Some are needs-based, some are elective and some are voluntary. In addition, Revenue Canada provisions for charitable giving mean that some of the payments are considered a charitable donation and are tax refundable. Please contact Marlene Bergsma, the Director of Communications and Admissions (mbergsma@smithvillechristian.ca), for more information about the various forms of assistance that are available. Please contact the Principal, Ted Harris (tharris@smithvillechristian.ca) for a confidential discussion of the financial aid programs that are available. If you want Christian education for your child, we will do our utmost to make it possible. Please contact the school office (office@smithvillechristian.ca) and schedule an appointment with our student services department to tour the school, to meet the Principal, Ted Harris, to discuss your family’s education needs and to discuss your student’s education plan. ● A tuition form with this year’s updated tuition information. ● A student fees form. ● A pre-authorized payment form. ● Information about our tuition reduction voucher program. You will also have the opportunity to fill out a course selection sheet. Grade 9 students fill out the Grade 9 Intention Form. Smithville Christian High School is pleased to be able to offer scholarships and bursaries. If this is the right school for you, we work hard to make it affordable. Click here for our bursary application form. You may also request a confidential meeting with the principal to discuss the various needs-based financial aid programs that are available. All information shared will be kept strictly confidential. We look forward to showing you how accessible Christian education can be. Students considering attending a Christian school for the first time are invited to apply for our Christian School Foundation entrance scholarship. Read more. . .
Every November, on Take-Your-Child-To-Work Day, Smithville Christian High School hosts Grade 8 Day, specifically designed to introduce Grade 8 students to high school life. It’s a fun-filled, action-packed day that allows students to tour the school, meet the teachers, and find out what they can expect on a typical day in high school. Please contact the school for more details about this year’s version of Grade 8 Day, or to register. We love introducing young students to our school because it’s such a welcoming place. Every January, Smithville Christian High School hosts an Open House to showcase our school to prospective families. If you have a student in Grade 6, 7 or 8, or you are interested in attending this fun, free, no-obligation family event, please contact the school for more information about this year’s version. We’d love to show you why we’re so excited about our school. 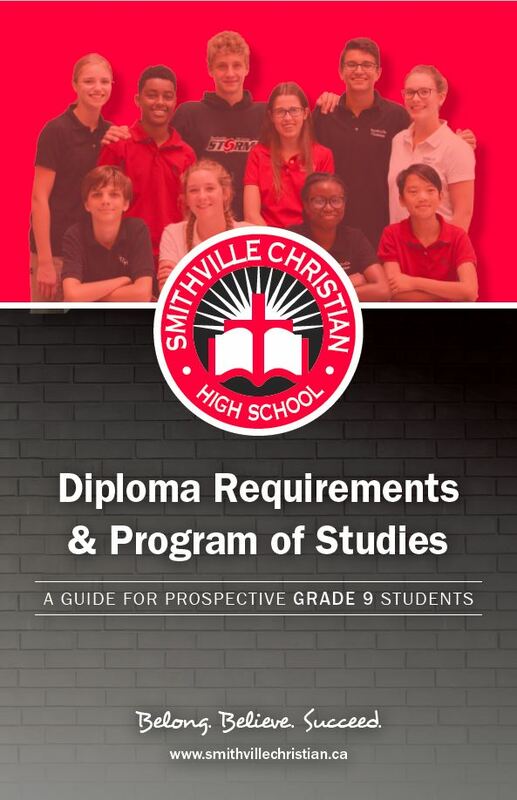 Smithville Christian High School is pleased to offer a number of placements to international students, along with homestay opportunities with safe and welcoming host families. Prospective international students or their agents are invited to contact Marlene Bergsma, the International Education Coordinator for application forms and for information about our international student program. We look forward to hearing from you. Smithville Christian High School is located in the heart of the Niagara Region, at 6488 Smithville Townline Road (Niagara Regional Road 14) at the intersection of Wade Road. For a complete listing of staff members and their contact information, see the staff directory.